Giancarlo Stanton can’t stop hitting home runs. Miami Marlins right fielder Giancarlo Stanton is on some kind of hot streak. With yet another home run on Sunday (he’s homered in four straight games and nine times this month), Stanton now has 42 on the 2017 season — and 21 in his last 33 games. Just when it looked like Aaron Judge of the New York Yankees was going to usurp Stanton’s crown as the game’s top power hitter, Stanton has reclaimed it with a vengeance. Stanton’s season is already historic; only 11 times in the 162-game-schedule era1 has a batter hit 42 or more home runs in his team’s first 116 ballgames. But Stanton can set his sights on another historic mark: the pre-steroids single-season home run record of 61, set by Roger Maris in 1961. Mark McGwire, Sammy Sosa and Barry Bonds later surpassed Maris’s mark.2 But McGwire and Sosa either admitted to or tested positive for using performance-enhancing drugs, and Bonds was mentioned prominently in the Mitchell Report (which investigated the use of steroids in baseball), thus tainting their accomplishments in the eyes of many fans. So for Stanton, breaking Maris’s “record” would bring cachet even if it isn’t technically the record anymore. And by the numbers alone, Stanton — who needs 20 more home runs by the end of the season to best Maris — has an outside shot at the feat. For every batter who hit at least 35 homers in the first 116 games of a 162-game season,3 I recorded how many homers each managed over the rest of the season. About 11 percent managed to hit at least 20 more home runs. So there’s a chance. But if you look at who did the homering over the rest of the season, Stanton’s odds might need to be adjusted downward more than a little. 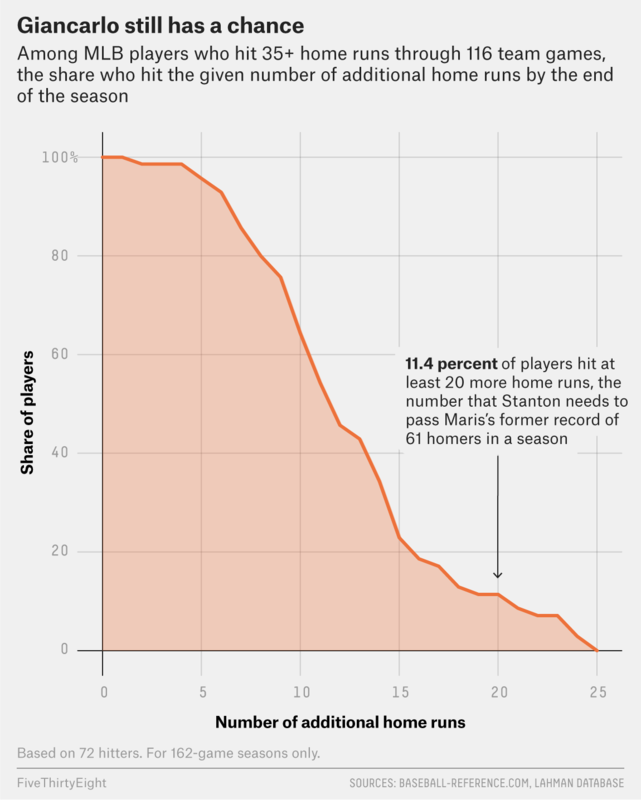 Of the eight hitter-seasons in our sample with 20 or more home runs between Game 116 and season’s end, all came in the steroid era, and only one — the great Ken Griffey Jr. — belonged to a player never associated with performance-enhancing drug use. The most by a recent player was the 18 late-season homers that Jose Bautista hit in 2010. Want a late-season home run barrage? Juice up. Based on 72 hitters. For 162-game seasons only. Implication of PED use based on the Mitchell Report, failed drug tests and player admissions. That means Stanton will need the kind of performance not seen since the steroid era to beat Maris’s old record — a tall order, even for one of history’s greatest power hitters. Of course, maybe juiced balls are the equivalent of steroids for today’s batters, which would certainly boost Stanton’s odds. Either way, to get there, he’ll have to stay nearly as hot as he’s been in this recent streak over the entire rest of the year. Bonds holds the current record with 73 home runs, set in 2001. This sample included 72 players.